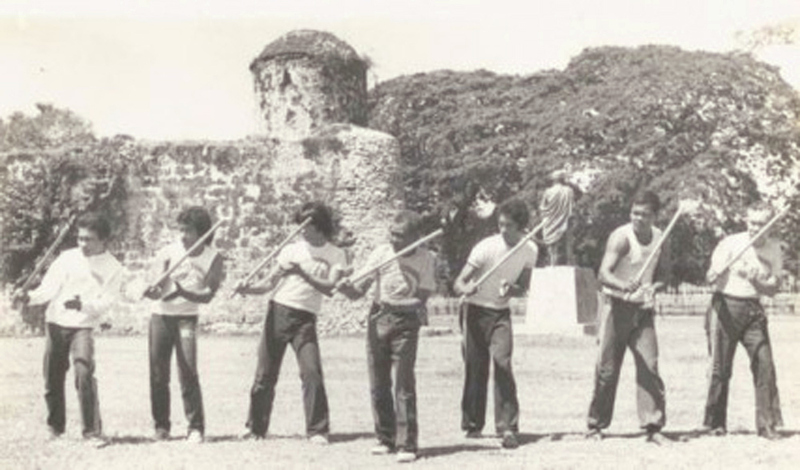 Balintawak is the name given to the personal escrima style of Venancio "Anciong" Bacon in the first half of the 20th century. Using a single stick as its primary tool, it is a close quarters art in the "corto linear" tradition that was developed in the tight urban spaces of Cebu City making it increasing relevant and practical in our urbanized world. We don't like to fight. We try to avoid it at all cost. However, sometimes the choice is not ours and we are forced to defend ourselves. In this case we have found that the most effective way to bring a confrontation to an end is to hit the person in the head... hard... and fast. We aren't flashy but we are effective. We don't want to show off, we just want to go home. The typical paradigm in martial arts is to teach unarmed techniques first and weaponry later. Filipino martial arts turns this model on its head, beginning with weapons and graduating to empty hands. This develops attributes relevant to combat such as speed, timing, power, and control at a faster rate by engaging in a more intense experience. If you can successful manage sticks that routinely move at 60+ mph, then a punch coming towards you doesn't seem like that big of a deal. The concepts and techniques that we develop with the stick in Balintawak work regardless of whether we are using a stick, a blade, or empty hands. There is consistency across categories. The art speaks to a fundamental truth about the movement and expression of the human body. Balintawak is built around 12 basic strikes which take into account any angle of attack that the human body is capable of. Each strike is paired with a defense and counter strike. Balintawak places a heavy emphasis on defense. Anyone can swing a stick but it takes skill to stop a stick moving at your head with intent. It doesn't matter how powerful you are, if you don't stop that strike you aren't going to get a chance to launch your own. Once a proficiency is shown in the basic strikes and the defense and counters the student is taught the 5 groupings. Each grouping consist of a small number of related movements that focus on a different attribute or concept of combat. Once these building blocks are assembled the student learns to improvise and develop their own personal style. This is the framework of Balintawak. If you have no prior martial training it provides a solid foundation on which to stand and it allows those with previous experience to integrate their other arts. The art as it was originally taught by Venancio Bacon was organic. Everyday a new technique or concept was taught and over time the student accumulated the experience and knowledge to become a formidable escrimador. The system of 12 strikes and groupings was developed and formalized later by GM Atty. Jose Villasin under the guidance of GM Bacon. There are several main branches of the Balintawak tree that all stem from Venancio Bacon, some still use the organic system that Bacon instructed in while most have embraced the system developed by GM Atty. Jose Villasin. Regardless of the pedagogy used the goals and values are the same. Teaching is an important aspect in the development of the Balintawak practitioner. As the student progresses they are tasked with sharing their knowledge with newer students. This helps develop a deeper understanding of the concepts and techniques by forcing the practitioner to focus on every aspect of them. This is most prominent in the concept of "Agak", our version of sparring. While "Agak" does not have a direct English translation it can be taken roughly as "to guide". A senior practioner will feed strikes to a junior practitioner and correct their form as they defend and counter them. As the junior practitioner progresses the groupings are added. These exchanges are never scripted and are meant to test the reactions and defense of the junior practitioner while allowing the senior practitioner to train their offense. This practice culminates at higher levels in a free flowing exchange between the two practitioners, each vying to "take the flow" and put the other on the defensive, ultimately rendering them unable to continue the flow either through a trap, a disarm, or some other technique.